Queen Christina of Sweden is one of the most fascinating characters in the history of 17th-century Europe. As the only child of King Gustavus Adolphus, leading champion of the Protestant cause during the Thirty Years' War, she succeeded him on the throne at the age of six, abdicating 22 years later in order to move to Rome where she could openly practice her previously secret Catholicism. While still a reigning monarch, she invited a number of eminent artists and scientists (including René Descartes) to Stockholm, and in 1652 a company of Italian musicians arrived, engaged to supply the court with the very latest of music from Italy. A manuscript presented to Bulstrode Whitelocke, the English ambassador to Sweden at the time, contains some of the music that the queen would have been treated to. The programme on this disc consists of a selection from the Whitelocke manuscript, with Carissimi's large-scale cantata I Naviganti at its heart. These duets and trios form a kind of refined entertainment music for intimate occasions: emotionally charged, yet playful songs about love and passion intended for an aristocratic audience. 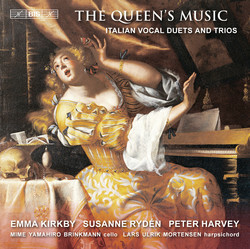 The combination of simple yet elegant melodies and colourful, sometimes even bold, harmonies lends these songs a particular sweetness which is here brought out by a close-knit group of some of the finest performers in the field of period performance today, with Emma Kirkby and Peter Harvey representing Whitelocke's country, and Susanne Rydén and Swedish-based cellist Mime Yamahiro Brinkmann the realm of Queen Christina. They are joined by the Danish harpsichordist Lars Ulrik Mortensen, who also adds variety to the programme with instrumental solos by Frescobaldi.